China Times reports [Google translation, via Mac Otakara] that Taiwanese chip firm Chipbond has been selected to provide a number of components for the iPhone 5S, including the touch display driver as well as chips to support fingerprint sensor and near field communications (NFC) capabilities. The report suggests that Apple will use the fingerprint sensor functionality to enhance the security of NFC features such as mobile payments. Rumors of fingerprint sensor technology for the iPhone have ramped up since Apple's acquisition of mobile security firm AuthenTec last year. AuthenTec has been rumored to be cutting off its fingerprint sensor customers this year, presumably to focus on supporting Apple's own efforts in the area. Reliable KGI Securities analyst Ming-Chi Kuo has also stated that a fingerprint sensor will be one of the differentiating features for the iPhone 5S. NFC has been a long-standing rumor for the iPhone, and evidence supporting its inclusion for the iPhone 5 failed to pan out amid claims that the device's design wouldn't even accommodate an NFC antenna. Some have suggested, however, that Apple could have novel plans up its sleeve for deploying NFC within the mostly metal case of the iPhone 5 that will presumably carry over to the iPhone 5S. Still, specific claims of NFC for the iPhone 5S have been essentially non-existent until now. Last July, it was reported that Apple was deliberately moving slowly into the mobile payments field that could tie in closely to NFC technology. For the time being, Apple is focusing on its Passbook app to offer a digital wallet of passes, coupons, and loyalty cards, although it is easy to see how its functionality could be expanded to include mobile payments and NFC. Foxconn is reportedly ready to begin ramping up iPhone 5S production, using the same production lines currently used for the iPhone 5. Easier to flash your wrist than pull out your phone. Never quite understood the purpose of NFC. Pulling my wallet out of my pocket and taking a card out isn't an arduous task I'm longing to rid myself of. The fingerprint sensor's a nice idea (if it can replace typing in lock screen passwords it'd be fantastic) but Apple's never done this before, not even in their laptops. Apple, i don't care if you re-release the iPhone 5 in its exact current state since its still one of the best smartphones money can buy even in 2013. Just for the love of all things sacred do something about iOS. It needs a very significant update. is maybe this time the S for Security (3GS was Speed and 4S was Siri) ? 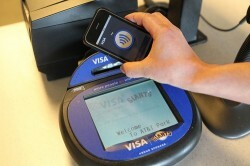 NFC is so old and hardly used any where. I'm an apple fan, but they seem to be the last one to show up with technology that's been out for a long time. Give me a 4.5 or 4.8 screen and I'll be a happy camper. You can keep NFC and the stupid fingerprint reader. GEEZ!!!!! Rumors of fingerprint sensor technology for the iPhone have ramped up since Apple's acquisition (https://www.macrumors.com/2012/07/27/apple-to-buy-authentec-for-356-million/) of mobile security firm AuthenTec last year. AuthenTec has been rumored to be cutting off its fingerprint sensor customers (https://www.macrumors.com/2012/09/24/authentec-said-to-cut-off-non-apple-fingerprint-sensor-customers-in-2013/) this year, presumably to focus on supporting Apple's own efforts in the area. Great. Now a thief is gonna steal my phone and my finger. You want a finger? I can get you a finger, believe me. There are ways, Dude. You don't wanna know about it, believe me. Hell, I can get you a finger by 3 o'clock this afternoon... with nail polish.